Blood donation session in Larne. The Rotary Club of Larne is encouraging local people to support a blood donation session in the town this week. 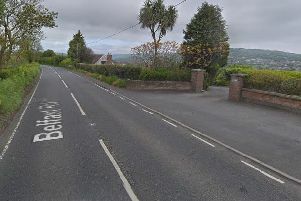 The Northern Ireland Blood Transfusion Service will be at First Larne Presbyterian church hall this Wednesday (August 8) to receive donations. New, lapsed and frequent donors will be welcomed between 1.30pm - 4.00pm and from 5.30pm - 8.00pm. "If you are one of the 94 percent of people in Northern Ireland who do not give blood there is an opportunity to put this right next week," said a Larne Rotary spokesperson. "The last blood donation session in Larne attracted 126 people; 107 units of blood were taken and 11 new donors. "The Rotary Club of Larne has been working in partnership with NIBTS for some years now to promote blood donation. As a result of their combined efforts the town tops the province’s donation league table." Rotarian John Shannon commended the people of Larne for supporting the sessions. "I hope more will come along to the next donation session, especially young people," he added. "Giving blood is easy; it takes only one hour of your time and can literally save a life." Telephone 0500 534 666, text BLOOD to 60081 or visit www.nibts.org for more information.